HomeGold IRA BlogGoldWhat Were the Top-Performing Assets During the First Half of 2014? 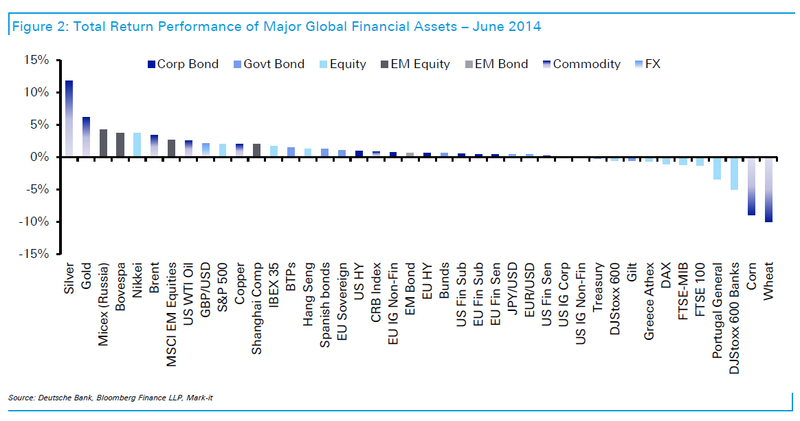 What Were the Top-Performing Assets During the First Half of 2014? The end of June marked the end of Q2 2014 and the first half of the financial year. Can you guess what June’s top-performing asset was? And the only one yielding double-digit returns? None other than silver. Gold came in second, and the worst-performing asset was wheat. In Q2 (the months of April, May, and June), silver came in fifth, beating out the S&P 500 and Brent crude oil. In the first half of 2014 (Q1 and Q2, or January through June), gold came in third while silver came in eighth; both were still ahead of stocks and oil. See the Q2 and first half of 2014 charts courtesy of Zero Hedge. Two weeks ago we wrote about silver being an undervalued precious metal, and Futures magazine agrees. Rising industrial demand, price bottoms, and short squeezes can be said to be the major factors behind silver’s value right now, and they may drive up its price even further. It’s easy to overlook precious metals besides gold, but right now is perhaps a great time to pay more attention to gold’s less expensive sibling. Did you know the IRS allows you to keep silver and other precious metals in your retirement account? A precious metals backed IRA such as a Silver IRA can protect your retirement assets better than unstable paper-backed assets subject to bad monetary policy, inflation, geopolitical conflict, and corporate decisions out of your control. Silver is a physical asset which, unlike paper currency, will always have intrinsic value and industrial uses. Diversify your portfolio and protect it from financial risk by converting your old or current retirement plan such as a 401(k) or an IRA into physical precious metals. Call American Bullion at 1-800-326-9598 to get started today.